Interlocking brick driveways are built to last, and can power through years of foot or vehicle traffic, and all sorts of weather conditions. Our pavers are especially durable—they’re manufactured with PermaFinish technology, which helps them maintain their texture and great looks, and also their superior abrasion resistant wearing surface. And when installed by ICPI certified technicians, such as ourselves, they practically need no maintenance. Nothing disrupts a beautiful brick driveway quite like an unsightly oil stain, but it’s bound to happen. The best thing you can do is to treat the stain as soon as possible. The longer you leave it, the deeper it’ll penetrate and the harder it’ll be to remove. For the best results, use a cleaner specially made for removing oil stains from concrete pavers. Wipe excess oil from the surface, apply the detergent, and let it soak for several minutes. Then, wash it off with hot water. You may need to do this several times before the stain is totally gone. 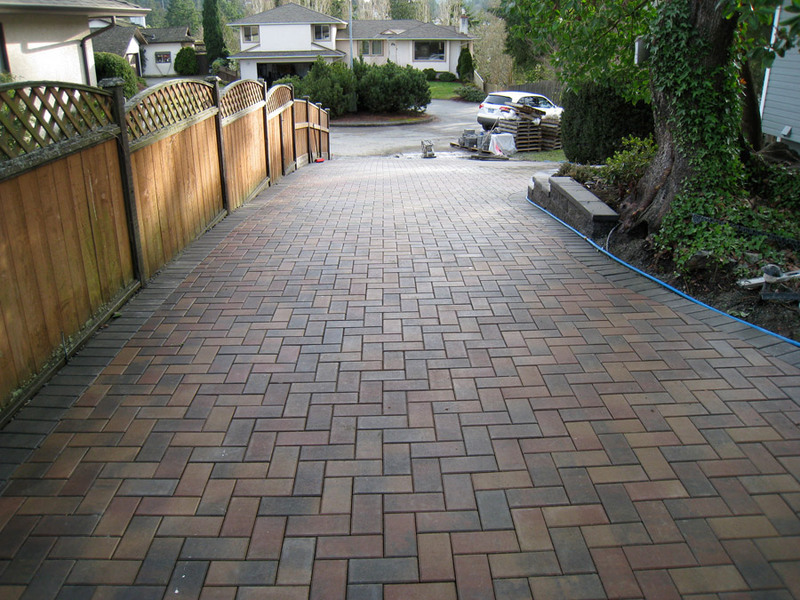 Now here’s the beauty of an interlocking brick driveway: If the stain is especially stubborn and refuses to budge, you can simply replace the stained pavers with new ones. It’s a seamless fix! Efflorescence is that white stuff that sometimes appears on your pavers. It’s a natural by-product of the cement hydration process and isn’t anything to worry about. It’ll wash or wear off with time. If you don’t want to wait for Mother Nature to take care of it, you can always remove it yourself. Be sure to use a cleaner that is specially made for concrete pavers, so you don’t damage or discolour the surfaces. Contact us and we can recommend a good product and explain the best way to go about removing the efflorescence. Interlocking brick isn’t an ideal environment for weeds—plants require sunlight, after all. But weeds, being weeds, like to take root in places they don’t belong. If your driveway or patio is sealed, then there’s minimal opportunity for greenery to grow in the joints. However, if your pavers aren’t sealed, then you may need to remove weeds by hand, or use good stiff brush, a power washer, or a biodegradable herbicide. It’s normal for the sand-filled joints to receive a little dirt from traffic on the pavement. It actually helps hold the sand in place. But if your pavers are exposed to driving winds or runoff, you may lose too much sand. And when excess dirt and debris fills the joints, it promotes weed growth and restricts water flow through the pavers. Joint sand can easily be replaced, but if you find yourself in this situation more often than you’d like, sealing your pavers will help hold the sand in. Have questions about maintaining your pavers? We have the answers. Contact us and we’ll help you out! While it’s easy to fall in love with the classic elegance of interlocking brick pavers, its true appeal is its durability. As gorgeous as pavers are, they are also amazingly strong. Our pavers are manufactured at a state-of-the-art facility, using only the latest technology. In other words, it’s quality you can count on. And when you combine quality products with quality installation, you have yourself a superior pavement system that can last 30 years or more. Here in Canada, pavers must be manufactured in accordance with CSA standards before they arrive at the job site. They’re required to have a minimum average compressive strength of 8000 psi, a maximum absorption rate of 5%, and in cold climates they must meet freeze/thaw durability standards. Because they’re pre-cast, each paver is of consistent strength and quality and meets or exceeds these durability standards. Pavers are manufactured on specially designed paving stone machines that produce units of higher strength and quality than normal concrete. 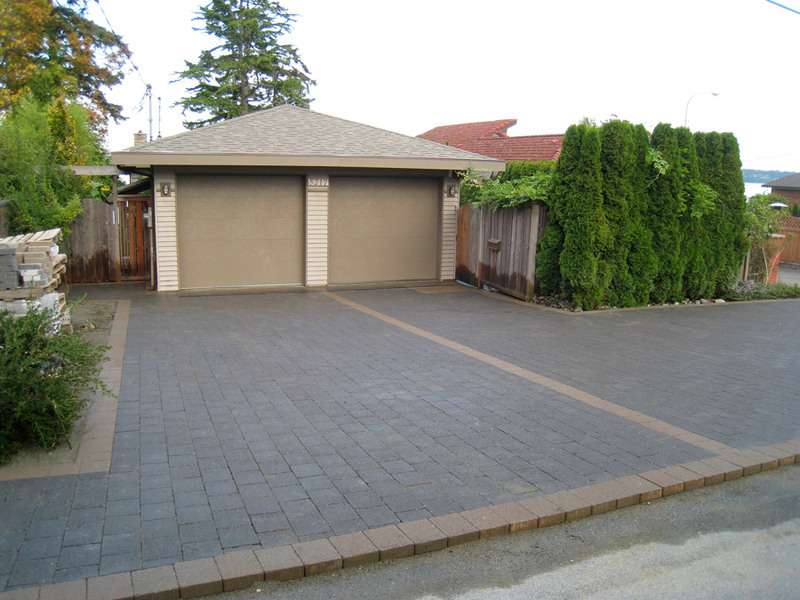 Pavers are a minimum of 8000 psi, compared to about 2500 psi for poured-in-place concrete. If there’s an earthquake (a legitimate concern here in Victoria BC), or a vicious freeze-thaw cycle, your interlocking brick paving system won’t crack the way concrete will. That’s because the joints between the pavers allow for flexibility. In addition to handling freeze-thaw with ease, pavers are not harmed by de-icing products or normal snowplow equipment. Well, the stronger the product, the longer it’s going to last, and the less it’s going to cost you in the long run. Over a life cycle, interlocking brick pavers actually cost less than concrete or asphalt. 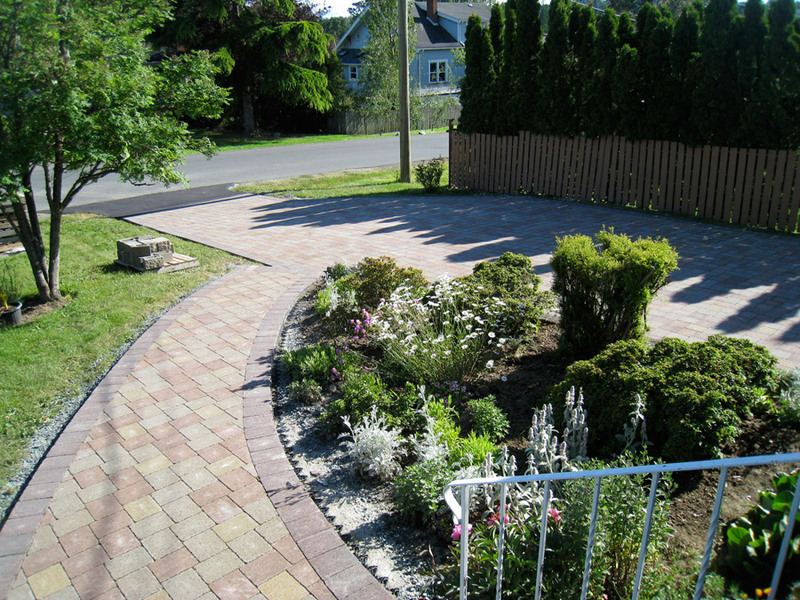 And when you combine that great value with endless design options, it’s easy to see why pavers are the best way to go. Contact us to find out more! There’s no doubt that interlocking brick paving stones are an affordable way to add beauty and style to any home. But did you know that paving stones also enhance nature while protecting its delicate balance? All of our pavers are made by Abbotsford Concrete, who has been serving Western Canada and the US with award-winning products since 1989. Their state-of-the-art manufacturing facility is right in British Columbia, which means our products are just a ferry ride away. It’s an easy way to support the local economy while reducing your carbon footprint. Picture our city for a moment. Victoria BC is beautiful, but it can get a little damp. Well, more than a little damp. And all of that rain has to go somewhere, right? When rain lands on an impermeable surface, like concrete or asphalt, it runs off and is diverted through curbs, culverts and storm drains. It not only carries with it oil, grease and other harmful chemicals, but can also cause flooding due to overloaded storm systems. Not the ideal solution. Interlocking brick pavers, on the other hand, are the ecological choice when it comes to storm water runoff. According to the ICPI, they’re proven to reduce runoff by up to 100%. Pavers are a permeable surface that allows water to naturally infiltrate into the ground. Plus, they effectively trap suspended solids, process nutrients and oils and immobilize heavy metals. Unlike concrete or asphalt, paving stones are manufactured in a specially designed, carefully controlled environment. Each stone is of consistent strength and quality, and installation is not affected by time or temperature. This reduces the amount of time and energy spent on dealing with material failure, especially when compared to site-formed pavements. Interlocking brick pavers are virtually maintenance free. They require less energy and resources over their life cycle than concrete or asphalt. Plus, if a brick is damaged or stained with oil, there’s no need to redo the entire driveway or patio. All you have to do is replace that one brick. It’s quick, easy and conserves the use of raw materials. In other words, it’s an environmentally sound repair. Conventional pavements, including concrete and asphalt, can get incredibly hot during the summertime. All of the heat is absorbed during the day and slowly released during the night, creating urban heat islands. And when you combine that with storm water runoff, you’re left with abnormally warm water temperatures and impaired water quality. Interlocking brick pavers can be made in light colours to increase surface reflection, thereby reducing ambient temperatures. In addition, light-coloured pavers can reduce also the need for nighttime lighting, thereby conserving electricity. Although concrete pavers are a relatively modern product, the concept is anything but new. Segmental paving systems have been around since the Roman armies laid the first brick around 500 BC. Fed up with muddy, cumbersome roads that slowed down their troops, they devised a more efficient way of getting around. The Romans were a clever bunch. They created deep roadbeds of crushed stone that allowed for proper drainage. On top of the most heavily travelled routes, they added six-sided paving stones that cut back on the dust and reduced drag from wheels. The result was an intricate system of roads that connected cities, major towns and military bases. 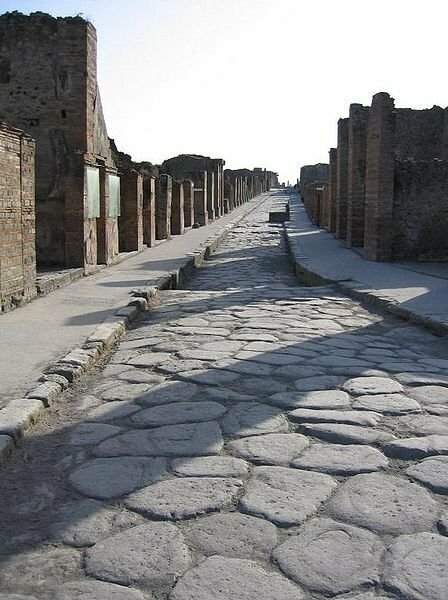 At the peak of Roman development, there over 400,000 km of roads, of which over 80,500 km were paved with stones. These roads were so well-designed and well-constructed that despite being neglected during medieval times, many are still in use today, thousands of years after they were first built. One of the most famous Roman roads that exists today is the ***Appian Way***. It was the widest and largest road of its time, and stretched over 500 km from Rome to the port of Brindisi, on the Adriatic coast. Today, the road is remarkably well preserved. You can stroll along a 15-km stretch of paving stones, worn smooth by millennia of use, and marvel at the monumental feat of engineering that changed the face of roads forever. This type of stone paving technique continued to be used throughout Europe, but it wasn’t until the 1950s that concrete units began to be produced. Following WWII, there was a dire need for reconstruction. The Dutch needed to replace clay brick streets damaged by the war, so they started manufacturing dimensionally consistent, hand-sized concrete units. In the 1960s, the Germans jumped on board and developed high-efficiency machinery for the production of interlocking concrete pavers. The technology quickly spread throughout the rest of Europe, as well as Australia, New Zealand and South Africa. Finally, in the 1970s, the popularity of paving stones reached the shores of Canada and spread to the United States. They were an immediate hit, and the paver industry boomed. According to the ICPI, it grew from 80 million square feet in 1980 to 755 million square feet in 2005. Growth has skyrocketed in other parts of the world as well. Globally, there is at least one square foot produced for every person living on Earth. Every second,1000 pavers are made. Technology has come a long way since Roman times, but the idea remains the same: Paving stones are beautiful, natural and durable, and are an affordable way to add style and class to any outdoor space. If you’d like to see paving stones in a modern setting, check out the rest of our website. And of course if you’d like to know more about bringing this time-honoured tradition to your own property, don’t hesitate to contact us.